Why do people develop a loyalty, even obsession with one make of car? We don’t become equally fanatical about our choice of insurance company or supermarket. Eleven years later, I’ve passed my test and had two fairly terrible cars to my name. The first was a 1963 mini, which cost £30. I bought it off my girlfriend. It was so frail that if I slammed the door too hard. the sliding windows used to get in the car with me. Its replacement was my parent’s old Austin Maxi, with the driving finesse of a removals van – but to be fair almost as much carrying capacity. But by 1979 I was now earning enough, not to afford to buy, but to consider taking out a loan to buy, the car I really wanted – an Alfa. So what better choice than a second hand Alfasud ti? This was the first car in which I saw 100mph – not bad for 1300cc. Disc brakes all round, 5 speed gearbox, it was advanced for it’s time. The flat four engine had a fabulous beat and the handling was delicate and precise. And while Alfas were never legendary for reliability, it never stranded me or failed to start. True the passenger’s seat collapsed and any stone chips had to be treated instantly otherwise rust would eat the whole panel. When I got married my Alfasud had to go help cover the deposit on our first home. But two years of pining later, I bought a black 1.5ti, the habit could not be broken. Strictly speaking, this wasn’t my car. An Australian friend working in Britain had fallen in love with my ‘sud and bought an elderly GTV. When he returned to Australia he left me the car to sell for him. A lovely looking car with a great engine. But a real struggle to drive with the rear mounted gearbox making gear changing a lucky dip. Very nearly very good but a constant source of frustration. By this time I was condemned to driving company cars Remember the Ital, Montego, Talbot’s Sunbeam & Horizon… I had them all. But the lure of Alfas remained. This time it was going to be a classic – as a second car. I remembered seeing the Bertone GTs from my childhood trip to Italy. A friend spotted a 1972 model in Exchange & Mart for under £1000 and range me immediately. So I went to see it on my way home from work. It wasn’t great but I negotiated purchase for £800 and left a £12 deposit – all I had on me. It went in 1990 when we needed a more practical second car for the family. I had it restored and I wish I never sold it – even though it went for 6 times the purchase price. More years and more boring cars later, I was attracted by a radical new Alfa model, the 164. While a big saloon it was nimble and had a superb 3 litre V6 engine. Although an 0-60 dash was quick, the torque steer would take you across to the other side of the road in the process. But this was not a lucky car. Someone drive into the back, and before repairs could even begin, a deer ran out in front of me, doing massive damage to the front – and the deer. The 164 finally had to go when my wife and I went into business and needed a large estate car. We certainly got one – a Citroen CX Safari. After selling our business I rejoined corporate life. So more wilderness company car years passed, until the new 146ti became available as a surprise user choice. The sporty version of the workhorse 146 hatchback, while never another ‘sud, it had a a great 2 litre twin spark engine and very lively performance. This was a very reliable and totally rust free car. Could it really be an Alfa? 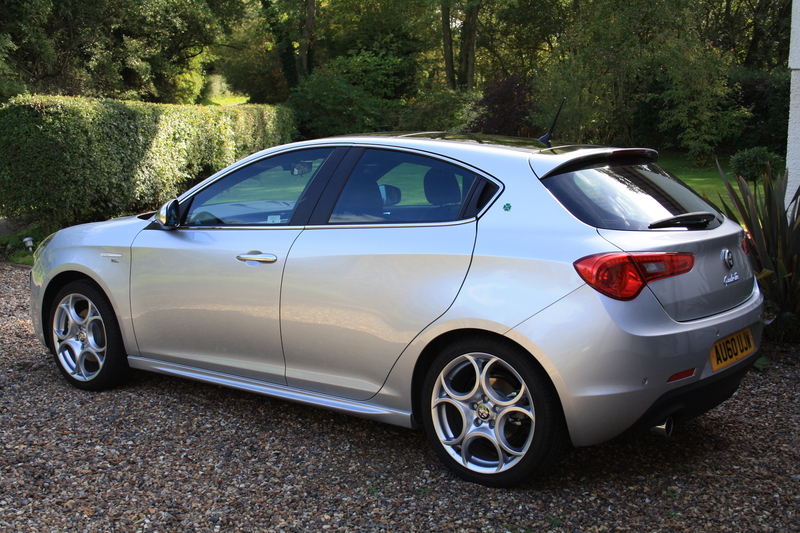 Holiday camping trips to France with the family proved this a thoroughly practical car. Alfa made a breakthrough in the late 90s with the Car of the Year award-winning 156. This was one Alfa I did not have to explain to my friends. Besides working for myself again, I could have the company car I wanted! Silver with red Momo leather and a real wood steering wheel, it was beautiful. The lines were elegant and the detailing exquisite in the true Italian tradition. The love affair lasted through three models including even the notorious Selespeed. Sadly we drowned one in a flood but the engine was replaced and the car survived its swim and never gave any trouble. By 2004 our two children were going off to university. At last the chance to have a sporty two door again. The launch of the GT provided the ideal coupe for a family. Almost as roomy as the 156, it also had a huge hatchback with folding rear seats. To my own surprise I opted for the diesel. While not as tuneful as a petrol both the performance and economy were superb. The handsome Bertone styling gave every drive asense of occasion.The the arrival of the 159 led us to change back to a saloon – but what a saloon. With the launch of the ti, Alfa gave the 159 the same lift the ti modifications had to the original ‘sud. So we also chose classic Alfa red to complement the black leather and huge silver alloy wheels. The car arrived with a brake fault which embarrassed Alfa. So to make amends they offered my then wife and I a trip of a lifetime (for car lovers at least): a weekend in Milan with a visit to the factory museum in Arese. This is the way to treat loyal – and with Alfa Romeo – long suffering customers. The giulietta promised a new dawn for Alfa. A new engine and a practical sporty chassis, if rather podgy styling. I may have taken my last sip of alfahol.